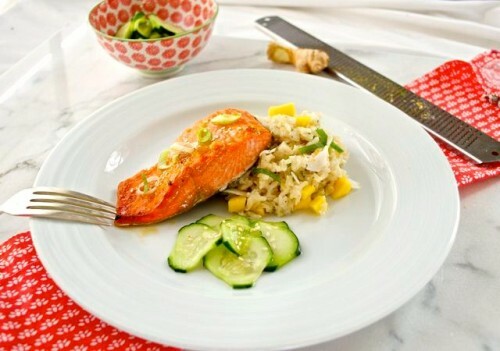 Miso Orange Salmon with Coconut Mango Rice and Pickled Cucumbers is salmon filets marinated in a miso-orange marinade and broiled until nice and caramelized. Serve it with creamy, coconut mango rice with citrus and ginger, and quick pickled cucumbers for a flavorful, healthy meal! Place the salmon in an 8x8" glass baking dish or a zip top bag. Place the mirin, miso paste, orange juice, zest, brown sugar, soy sauce, garlic, ginger, and black pepper in a small bowl and whisk until incorporated. Pour over the salmon, turning to coat both sides. Cover or seal, and marinate in the refrigerator for up to 3 hours or overnight. * When ready to cook, preheat the broiler. Place the salmon on a rimmed baking sheet and pour over enough sauce to cover. Broil on the middle rack of the oven for 4-5 minutes, depending on thickness, until caramelized and the fat has rendered. Place the coconut milk and water in a medium saucepan. Cover and bring to a boil over high heat. Stir in the rice and salt, and return to a boil. Turn the heat down to low and cover, simmering the rice for 40-45 minutes, or according to package instructions. Once the rice has absorbed the liquid, remove from heat and let stand covered 10 minutes to steam. Remove the lid and fluff the rice with a fork. Add the ginger, lime juice and zest, orange juice and zest, cilantro, mango, and salt to taste, and combine gently using your fork. Combine the cucumber slices with the salt in a small bowl. In another small bowl, combine the rice vinegar and agave syrup. Pour the mixture over the cucumbers, cover, and place in the refrigerator for about 20 minutes. Garnish with toasted sesame seeds. Total time above includes marinating the salmon for 3 hours. You can also marinate it overnight. I only marinated the salmon for 20 minutes and it still had a delicious flavor. *Miso paste is a soy bean paste that can be found in the refrigerated area of the natural food sections at most supermarkets. *Freeze your fresh ginger and use a microplane to grate it peel and all to get the quickest grated ginger! *For toasted coconut flakes, heat coconut flakes in a skillet over medium low heat until golden and fragrant, about 3-5 minutes, stirring frequently. For You can also buy pre-toasted coconut flakes at Trader Joe's for a time saver. *For toasted sesame seeds, heat the sesame seeds in a small skillet over medium low heat until golden and fragrant, 3-5 minutes. Salmon and cucumber recipe adapted from Shape Magazine's Broiled Miso with Spago Cucumber Salad, March 2014. Coconut Mango Rice recipe by Flavor the Moments.